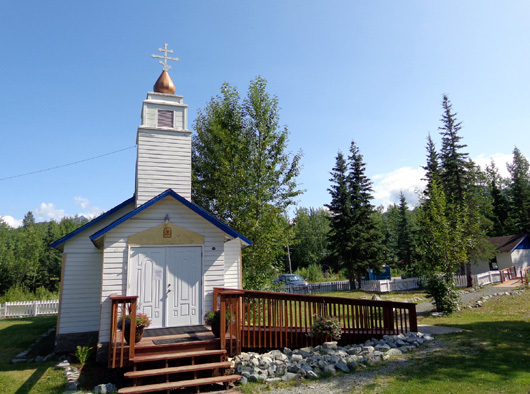 of the Dena'ina Athabascans in combination with Russian Orthodox traditions." 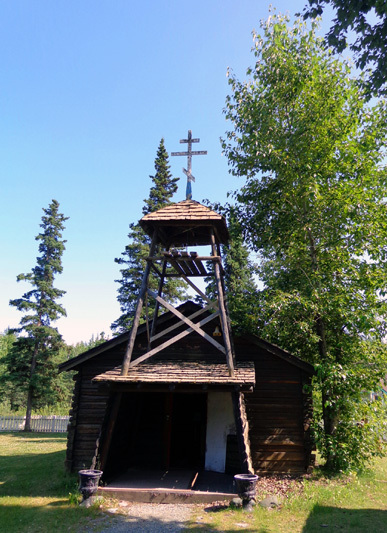 After hiking to Thunderbird Falls and Twin Peaks, both in the Eklutna Lake area, I stopped at the historical Russian Orthodox Church and picturesque cemetery in the old village of Eklutna [ee-KLOOT-na]. 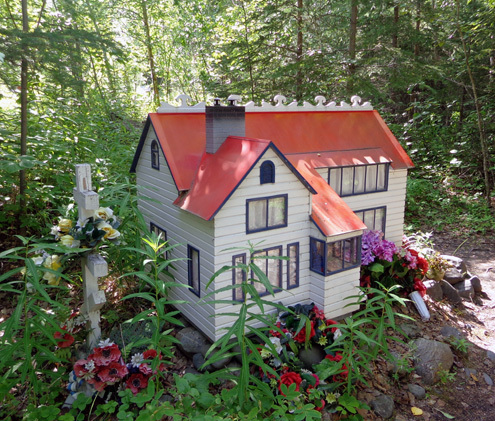 I'd read about the unusual "spirit houses" in the cemetery at this historical park but hadn't seen any pictures of them. 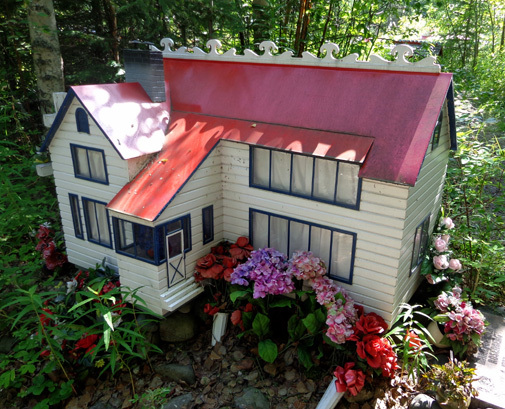 There are many different styles of spirit houses. I'll show more of them in a little bit. 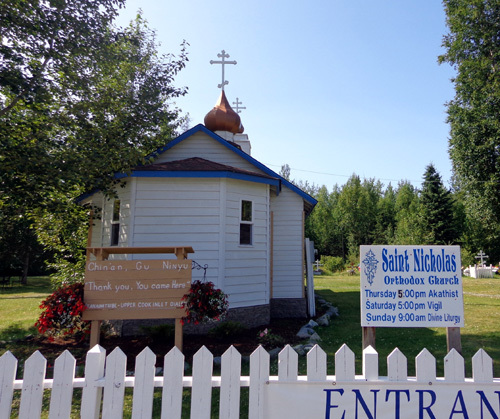 The old and new St. Nicholas churches are located just west of the Glenn Hwy. 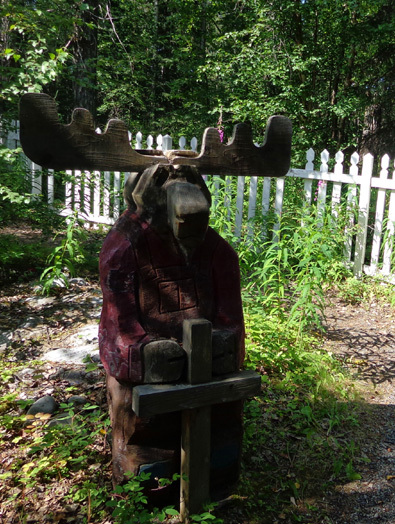 at the Eklutna Lake exit (MM 26.5) in the Eklutna Historical Park. 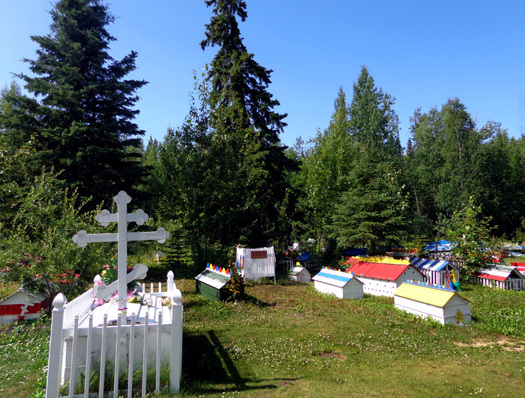 The two churches and the Russian Orthodox-Athabascan cemetery are located behind an attractive white picket fence. 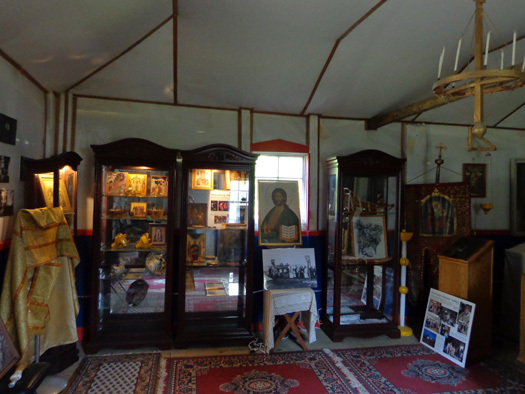 Visitors enter through a gift shop, pay $5 each, and either tour the place alone or with a guide. I went alone because I was tired from my two hikes, in a hurry to get back to the campground, and Cody was in the truck (sunny and about 70 F. -- I left the windows open). Only two other folks were on the grounds besides the guy in the gift shop. 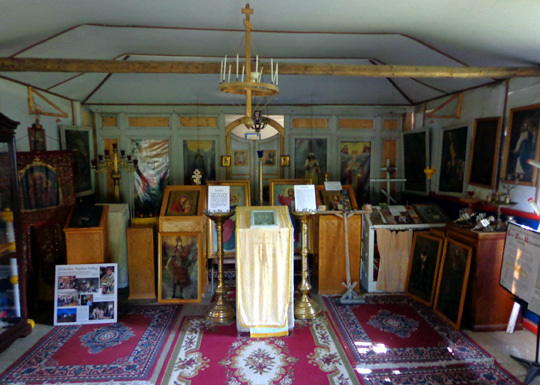 I went inside both churches and read some of the historical information. 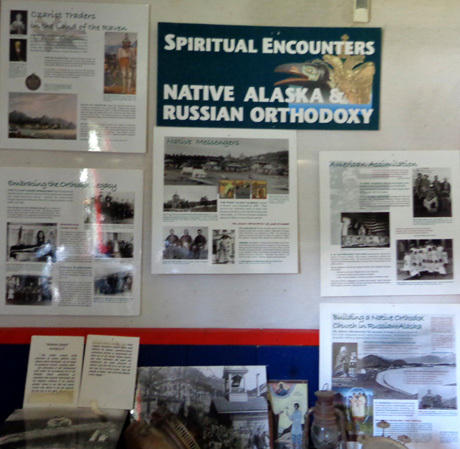 This Russian-Native Alaskan cultural mix still intrigues me even after all the information I�ve read since we�ve been in Alaska. 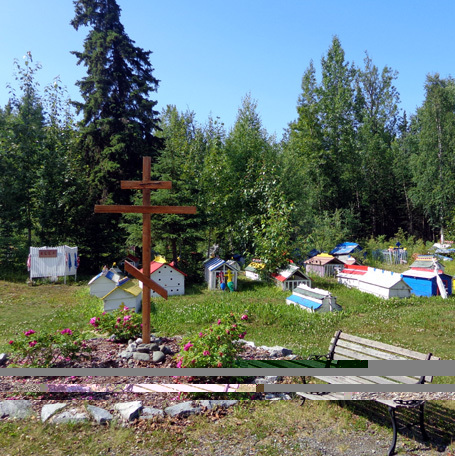 What I was most interested in, however, were the �spirit houses� in the cemetery. 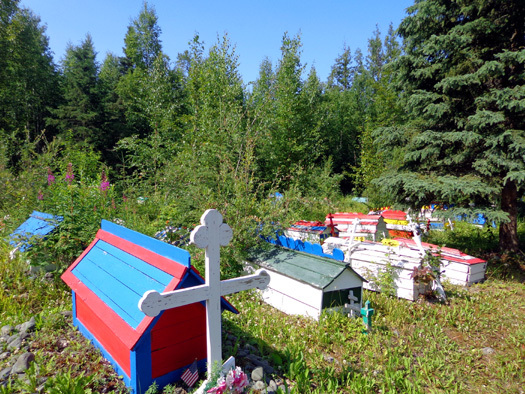 The cemetery we wandered through on the Kenai Peninsula didn�t have spirit houses. 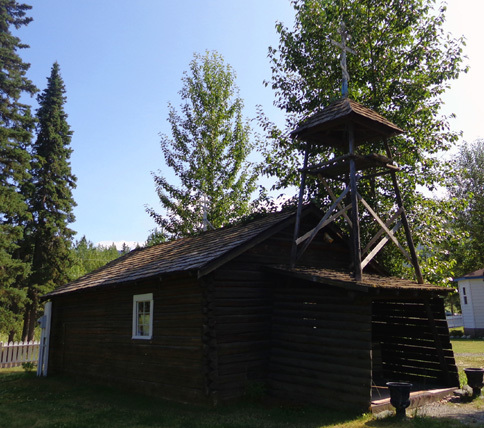 They are a custom unique to the Athabascans who settled around what would become the Anchorage-Eagle River-Chugiak-Eklutna area. 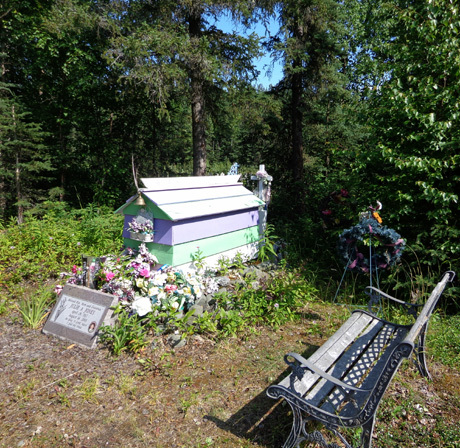 That's also one of the newer graves in the cemetery; she died in 2005. I was in too big of a hurry to get that creative. 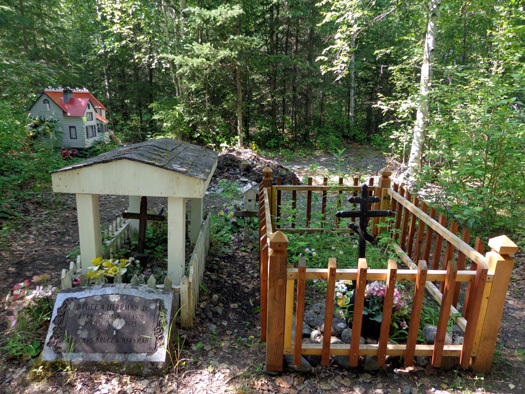 He was in the farthest reaches of the cemetery, near the house shown above. 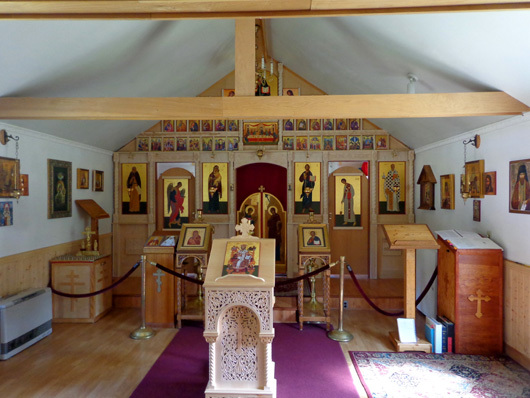 Check out the official church/park website for more historical and cultural information, the origin of the Orthodox three-barred cross and Native spirit houses, and more photos. I really enjoyed my day. Cody and I are tired tonight but we had a good time on our hikes near Eklutna Lake. Jim seemed to enjoy his day, too, especially since it was sunny. He had a good, long bike ride on base this morning and got to watch some of the aircraft that will be flying in the huge Arctic Thunder Air Show on Friday, Saturday, and Sunday. In the afternoon he cleaned the carpet and did some other work around the camper. In the evening we both relaxed and shared our experiences. 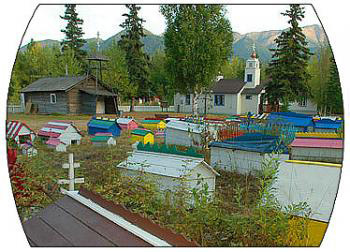 I like all the individualism displayed in this cemetery. 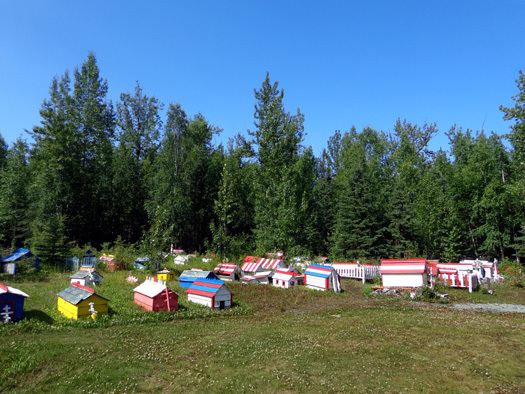 With the air show coming up, the Black Spruce FamCamp is getting pretty full. I hope there is at least one available campsite on Monday so we can extend our stay another four or five days. 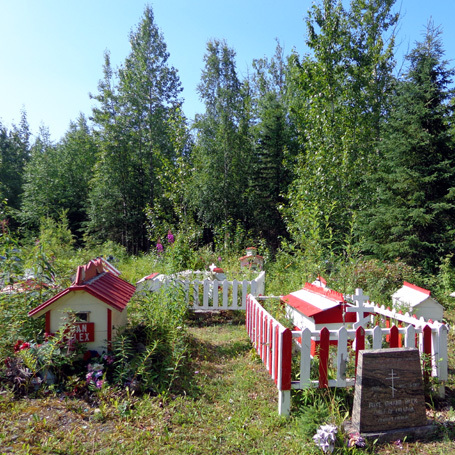 There are so many things to do in the Anchorage area!